/ What to Bring to a Music Festival? More Dancing, Less Stress! 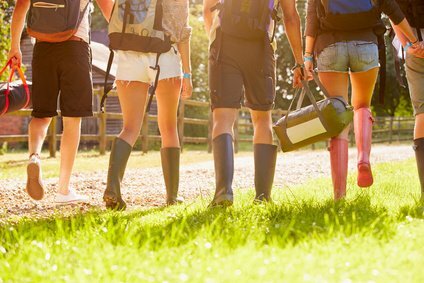 It’s that time of year again when the suns out and the festival season gets into full swing, but with all the excitement of seeing your favorite performers the decisions of what to bring to a music festival are often left until last minute. In this article we will be looking at the most important things that you shouldn’t forget to take with you in order to help you create your own music festival packing list. As with any time that you go away, it’s a really good idea to write a checklist of the things to bring camping so it’s a simple case of ticking each item when you pack it. That way you’ll be confident that you’re fully prepared for the festival, and won’t need to buy too many items when you get there. It may seem like a time saving exercise to make use of the stalls at the festival, but they’re often much more expensive than at your local shops- money that will be better spent on refreshments while you enjoy the music. With this all being said, it’s also important not to take too much with you. It can become a hassle having to transport it there in the first place, a lot of things may not be allowed on site, and festivals often have real problems with the amount of stuff that is left behind once things have finished. The trick with creating a Coachella camping list is to include essential items, a few fun items, but not to go overboard. Unless you have splashed out on more luxurious accommodation, you mustn’t forget to bring a place to sleep in. There are very easy to setup instant tents available so you do not need to worry about setting up your tent. You wouldn’t believe how many people forget to bring their tickets with them. Without it, you won’t be getting in! Festivals are the highlight of the summer for many people when they get a chance to see their favorite acts perform, but they can be very expensive and uncomfortable if you don’t take adequate steps to prepare before you arrive on site. It’s worth thinking through exactly what to bring to a music festival, so when you get there you can focus on the enjoyment and not worry about the practicalities.